If two robots crash into each other, there can be quite some force. What I have observed is that it can be strong enough to temporarily disconnects the batteries from their spring contacts. 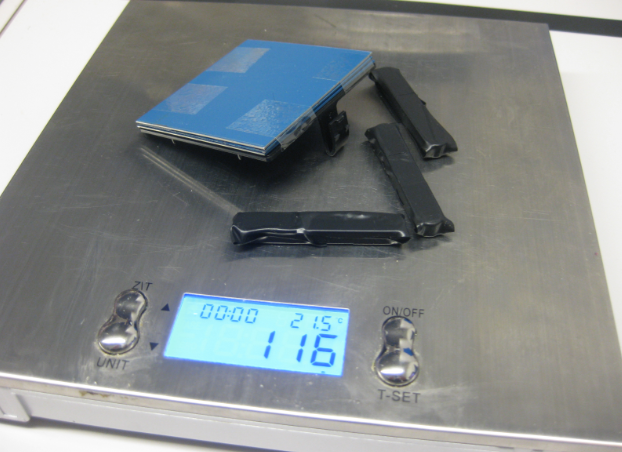 I use pieces of plastic parts to keep the batteries tight and in place. Sumo is about having enough grip on the ground to push out the other robot. 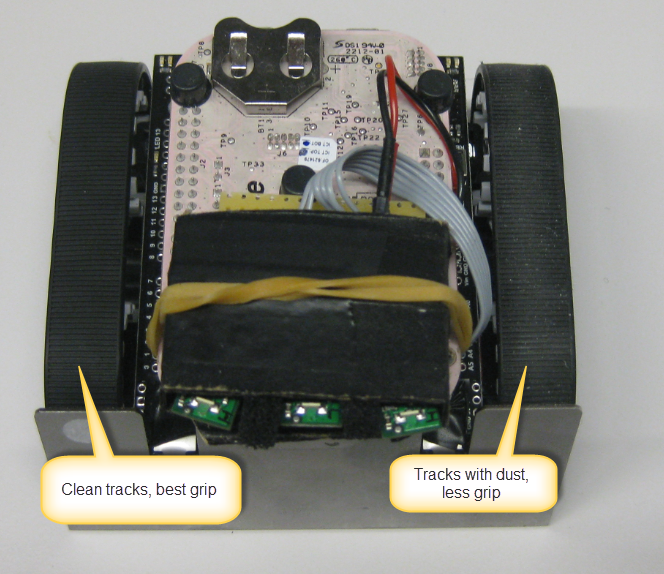 The Zumo chassis is using rubber tracks, and they get easily collect dust and dirty. Make sure you clean the tracks frequently. Rinsing with normal water has worked for me best. 💡 The black antistatic card box of the FRDM-KL25Z board is a good infrared light absorber too. It is always good to make sure to have the batteries fully loaded, and best to have a backup in place. Turning the motors 100% forward and then immediately turn them 100% backwards might cause a voltage drop you might need to consider. 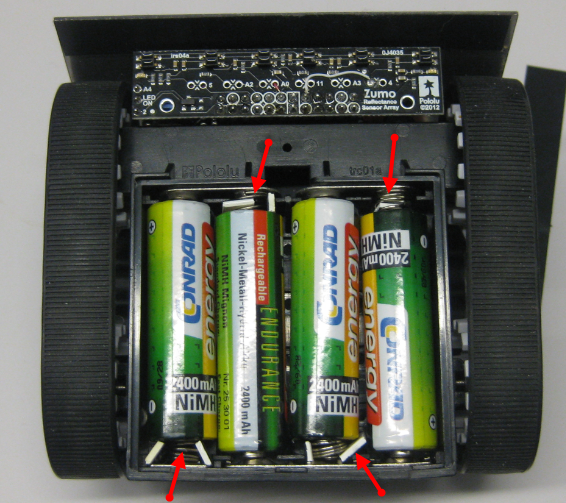 Having drained batteries will be not a good idea in any case. Up to 500 g mass are allowed for Mini Sumo Robots. Having more mass means getting more push, but as well more inertia of the masses. 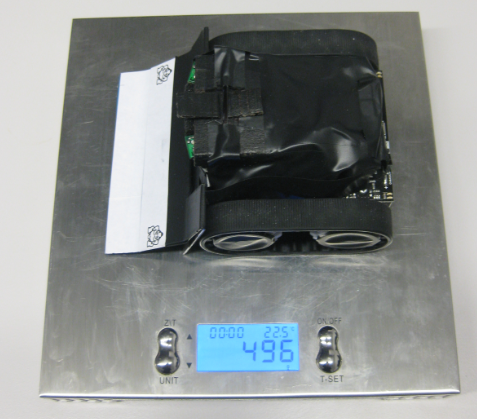 A ‘normal’ Pololu Zumo Robot is around 350 gram, so there is room to add some extra mass. I’m using small pieces of metal (wrapped with electrical tape) plus metal plates attached to the battery compartment. There is room below the batteries, and this way I have the mass in the center of the robot and I can keep the center of gravity low. 💡 And it is a bad idea to lose the added weight pieces during a battle :-(. The size limit for Mini Sumo class is 10×10 centimeter with no height limit. The front blade angle can be used to lift the other robot of the ground. The 10×10 cm limit only applies to the start and countdown state of a sumo bot fight, so one idea is to ‘unfold’ the robot after the countdown. 💡 Instead of using a servo or similar to ‘unfold’ the robot, I quickly move the robot forward and then stop it: the mass inertia of the extended blade will drop it down and then kept in place. I’m using electrical tape to have it attached. An extra idea would be to use magnets to keep it in place. The opponent robot is very likely using infrared or ultrasonic sensors to locate my robot. 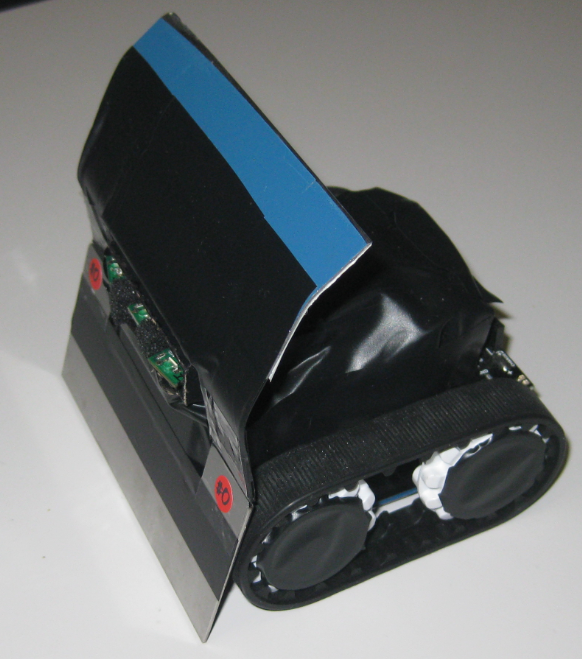 So I use infrared and ultrasonic absorbing material to have my robot less exposed. The extended front shield is ‘unfolded’ after the 5 second countdown. 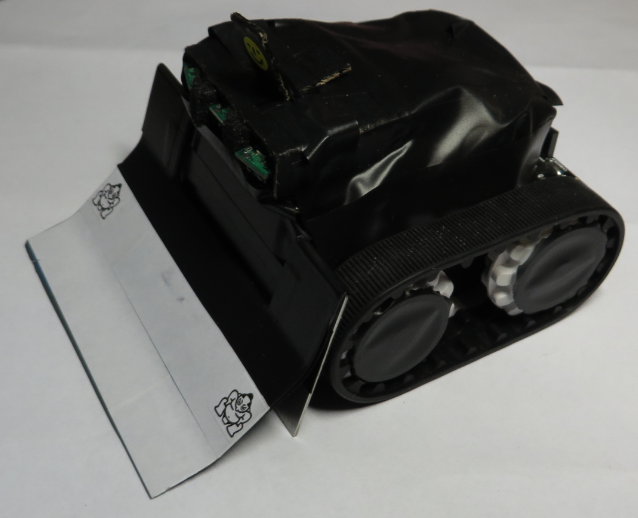 The front of the extended shield is using a white reflectance material to fool the opponent line sensors. Will see tomorrow if this can work :-). This entry was posted in Embedded, Kinetis, KL25Z Freedom Board, Tips & Tricks and tagged freedom board, KL25Z Freedom Board, software project, technology, Tips&Tricks, Zumo by Erich Styger. Bookmark the permalink. I think I did very well, but yikes, one robot ripped off (!!!) my tracks ;-).